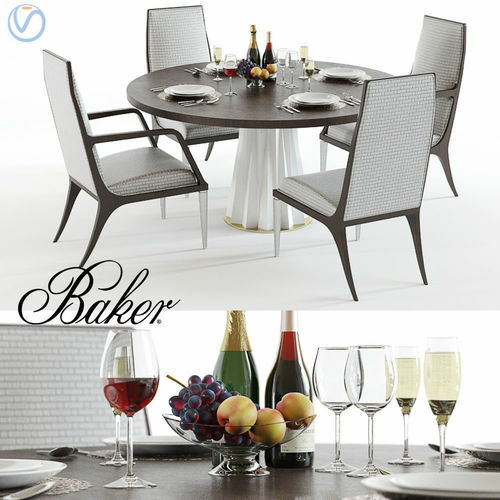 High-detailed 3D set of Baker Heliodor dining table, Jasper chair and armchair with tableware. Originals: https://www.bakerfurniture.com/dining/tables-accents/tables/heliodor-dining-table-60-3136-60#! . https://www.bakerfurniture.com/dining/seating/chairs/jasper-arm-chair-3145#!fabric=28-560 . https://www.bakerfurniture.com/dining/seating/chairs/jasper-side-chair-3144#! . Formats: 3Dsmax 2011 + Vray. OBJ. FBX. Don't forget to check my other models! Cheers!